Individuals with chronic obstructive pulmonary disease (COPD) often go through anxiety. In fact, COPD patients were found out to suffer from generalized anxiety disorder (GAD) three times more than others. Also, both diseases have some common symptoms such as chest tightness, increased heart rate, and shortness of breath. However, COPD is a progressive lung illness while anxiety is a mental health concern. The following paragraphs further delve into such distinctions. COPD is chronic since it is an illness that has no cure and it is obstructive since it is difficult for air to get in and out of the lungs; hence pulmonary. Unfortunately, it tends to get worse over time. Nevertheless, there are various treatments which help patients optimally function in their daily lives. It is an inflammation of the bronchial airways. The cilia (microscopic hair-like organelles), which are responsible for making the breathing tubes clean by sweeping mucus and facilitating airflow, get damaged. Consequently, coughing up mucus becomes an ordeal and the airways get congested and swollen. This happens when the alveoli, the lungs’ small and fragile air sacs get damaged. The lungs get bigger due to the stretching out of the alveoli’s walls. Eventually, it would be difficult for oxygen to enter as well as for carbon dioxide to go out. This is also known as non-reversible asthma as the attacks caused by the swelling and constriction of airways are not responsive to usual medications. Anxiety is the feeling of fear due to a threat which is characterized by being tensed, worrying, trembling, rapid breathing, and other related manifestations. This is a usual response to various stressors such as examinations, accidents, and other unpleasant situations. However, this already becomes a disorder when the intensity and duration of the anxiety impair the individual’s daily functioning. COPD is a lung disease while anxiety as a disorder is a mental health concern. There are three main types of COPD: emphysema, non-reversible asthma, and chronic bronchitis. On the other hand, anxiety is merely a usual response to threatening events and as a disorder, it has several types such as separation anxiety disorder, selective mutism, specific phobia, panic disorder, generalized anxiety disorder, and others. There are 12 types listed in the DSM 5. The major symptoms of COPD are persistent cough with a lot of mucus, difficulty breathing (associated with physical exertion), chest tightness, and wheezing or whistling sound when breathing. When one feels anxious, he or she feels tensed and worried, has increased breathing, heart, and pulse rates, and other related physical symptoms. The causes of COPD include first and second-hand smoking, exposure to lung-irritants, and alpha-1 antitrypsin deficiency (genetic condition). On the contrary, anxiety is a normal reaction to challenging factors while anxiety disorder may be caused by environmental (major stressor, childhood experiences, etc.) and genetic factors (heritability, gender-related, etc.). 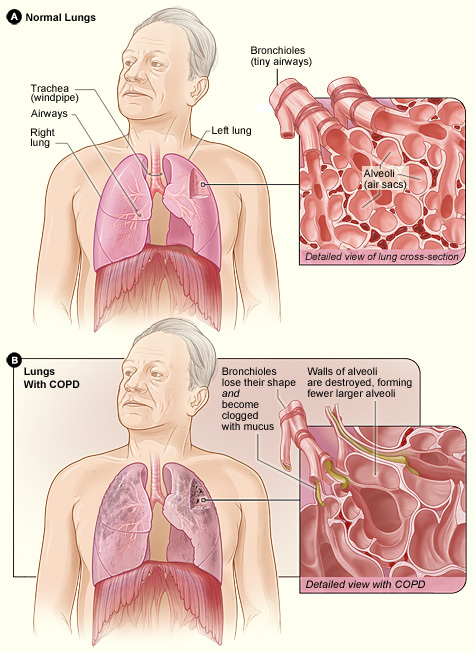 COPD is diagnosed based on the physical symptoms, pulmonary function tests, and medical histories. As a mental disorder, anxiety is diagnosed based on the inappropriateness of the fear, its persistence, and the level of distress. COPD has no cure but there are treatments such as lifestyle changes, oxygen therapy, vaccines, and pulmonary rehabilitation. Anxiety symptoms lessen when the threat goes away while some people who suffered from anxiety disorders claim to have been cured through appropriate psychotherapy. Patients with COPD consult a pulmonologist while those suffering from anxiety may consult psychiatrists, psychologists, life coaches, and other mental health practitioners. Both COPD and anxiety have some common symptoms such as chest tightness, increased heart and pulse rate, and shortness of breath. COPD is chronic since it is an illness that has no cure and it is obstructive since for air to get in and out of the lungs. Anxiety is the feeling of fear due to a threat which is characterized by being tensed, worrying, trembling, rapid breathing, and other related manifestations. COPD is a lung disease which has three types while anxiety as a disorder is a mental health concern which has 12 types. Unlike anxiety, COPD symptoms include coughing with a lot of mucus and wheezing. COPD may be caused by first and second-hand smoking, exposure to lung-irritants, and alpha-1 antitrypsin deficiency while anxiety is merely a response to a threatening event. A pulmonologist diagnoses COPD through the presentation of physical symptoms, pulmonary functional tests, and medical histories while a psychiatrist or clinical psychologist diagnoses an anxiety disorder through manifestations of the inappropriateness of fear, persistence of anxiety, and the resulting distress. There is currently no cure for COPD while anxiety dissipates when the source of threat goes away. gene balinggan. "Difference Between COPD and Anxiety." DifferenceBetween.net. November 22, 2018 < http://www.differencebetween.net/science/health/difference-between-copd-and-anxiety/ >. American Psychiatric Association. Diagnostic and Statistical Manual of Mental Disorders, 5th Ed. Washington, DC: American Psychiatric Publishing, 2013. Print. Bourne, Edmund. The Anxiety and Phobia Workbook. Oakland, CA: New Harbinger Publications, 2015. Print. Martin, R.D. The Complete Guide to Understanding and Living with COPD. Rye Brook, NY: Every Breath, LLC, 2010. Print.